IN the olden days he used to sing for his supper, but nowadays he has to shout for the right car at his wedding. 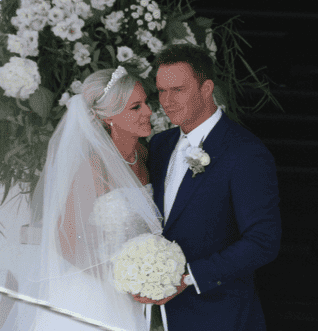 At his stunning Spanish nuptials last week, ‘People’s tenor’ Russell Watson was left to wait nervously for 50 minutes when his new bride, Louise Harris, 26, arrived nearly an hour late. 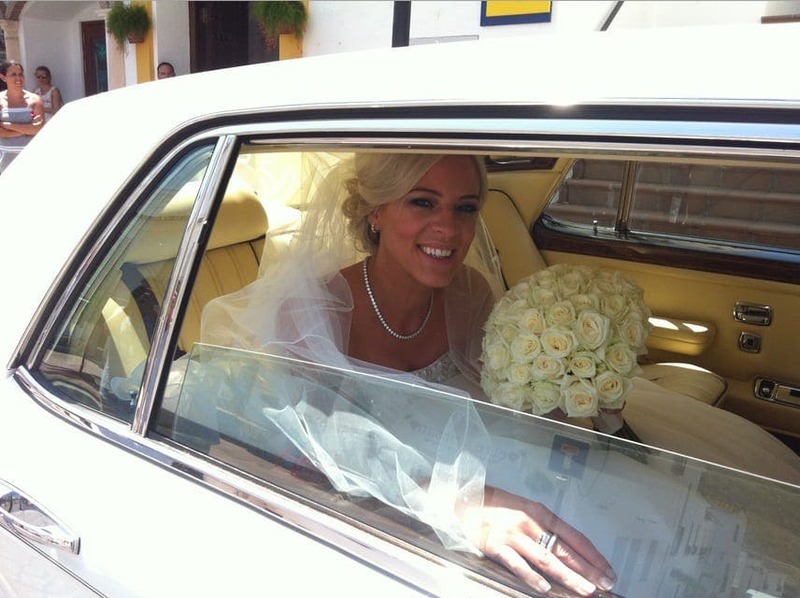 Due to not one – but two – vintage Rolls Royce’s failing to arrive at the allotted time to pick up his bride, she arrived at 1.50pm rather than 1pm. 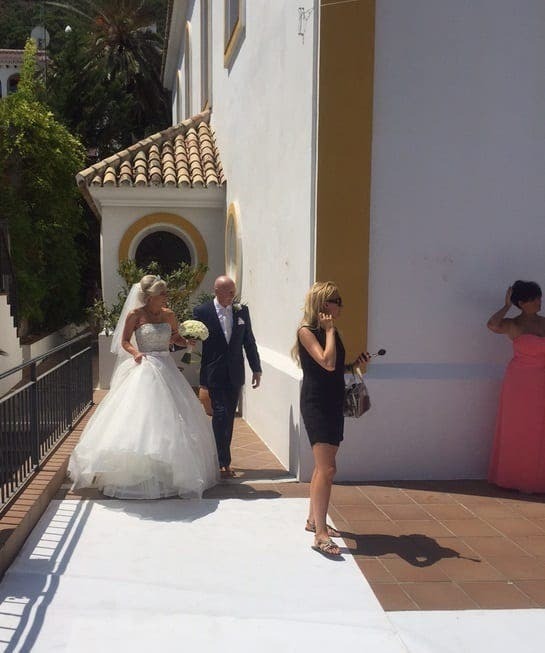 With a host of photographers from Hello Magazine waiting and the guests fanning themselves in the 30 degree Spanish heat, it is fair to say there was some considerable confusion. 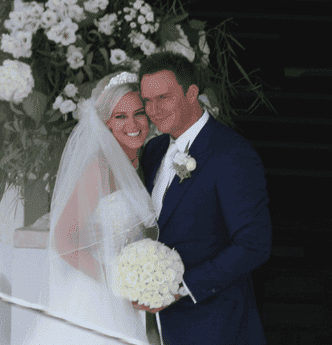 Fortunately for the huge opera star – who sang just days ago in the Colosseum of Rome with Andrea Bocelli – his bride, 22 years his junior, finally arrived in a third Rolls Royce, still looking stunning. 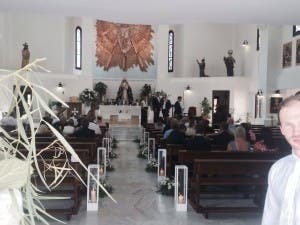 After a quick make-up stop outside the local post office, she walked up the steps of Benahavis Church, near Marbella, with her father and went inside for the shortened 20-minute service. 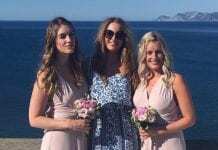 It was actually a blessing, with the couple understood to have been married in a registry office wedding earlier this week, in England. The 63 guests heard two readings and then gave, naturally, a rousing rendition of All Things Bright and Beautiful. He is, after all, the man behind The Voice, the UK’s biggest-selling classical album of all time and has sold over seven million albums worldwide. “You could clearly hear Russell’s voice ringing out over the assembled throng,” said church warden Bernardo Gallagher, 75. “It was an emotional service, one where you could see that everyone was moved and the couple kissed passionately at the altar”. 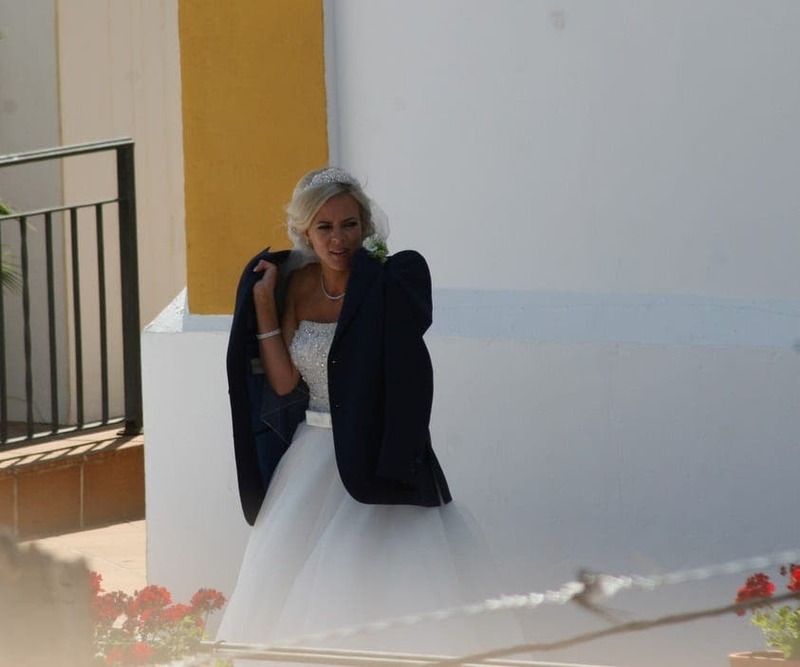 After the guests filed out to head to the reception at a restaurant in nearby Mijas, the couple were seen kissing at the door of the church. 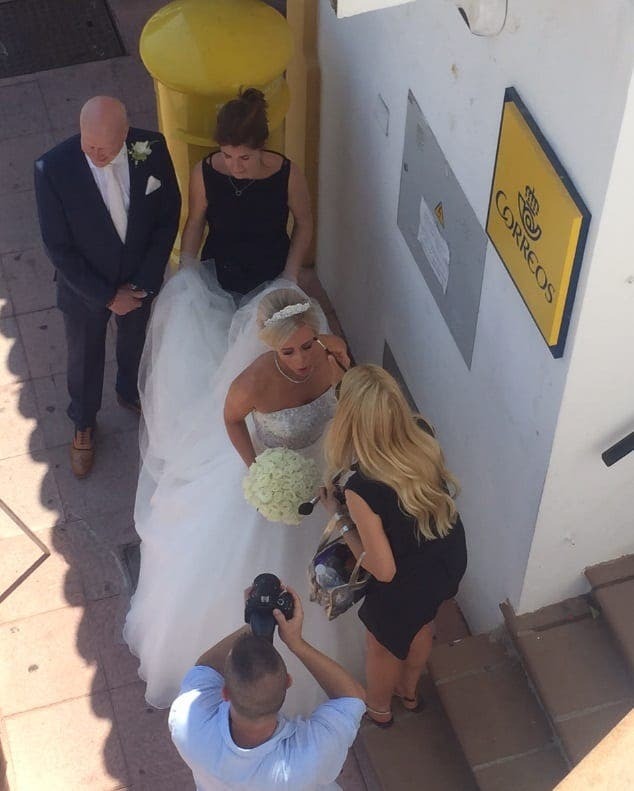 They clearly found it hot, drinking from plastic water bottles and looked nonplussed when they were asked to cover the bride’s headdress as they headed to their car to avoid awaiting photographers. Watson, 48, overcame two near-fatal brain tumours in 2006 and 2007, which left him suicidal. His first marriage to Helen Watson fell apart due the pressures of fame in 2001.